What will a future military quadcopter look like and how will it be deployed? The Original Twist concept looks like a fat Frisbee or puck, at least it does for the first few hundred metres of flight with not an arm or propeller in sight. Transportation: The propellers and arms are all tucked safely out of harm’s way, folded into the base of the puck. The folded puck can then be handled roughly and easily stacked up in racks. Launching: Here lies the real Original Twist. As you will see in the launcher description below, the robust pucks can be flicked out like clay pigeons at the astonishing rate of 600 a minute. There is no battery power used for taking off, getting under way and reaching height which is a good thing. Neither is there a warning howl as hundreds of drones start up, just a line of discs silently darting across the sky to a location away from the launch site and therefore no giveaway of the origin. At the end of the launch trajectory the propeller arms flip out and the journey towards the enemy continues using onboard GPS. The propellers sit at a slight angle to the body so that when in flight the puck is perfectly aligned to the airflow. Reduced drag with some lift from the domed top allows a good range of at least 12 miles which allows one launch vehicle to cover an area of over 400 square miles. Attack: The quadcopter/puck bodywork is made of moulded plastic explosive so they are very much like intelligent flying bombs. 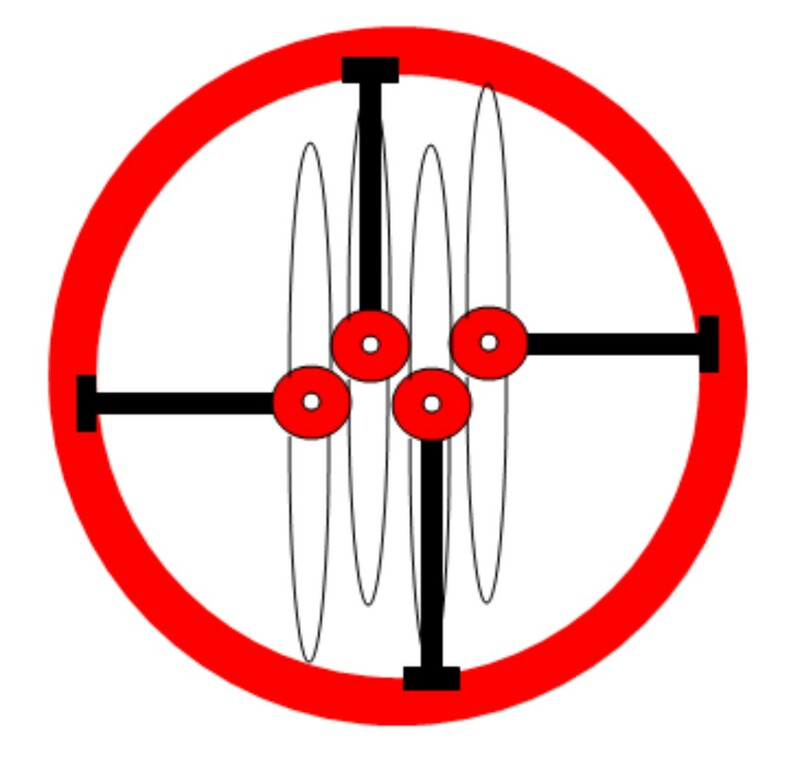 They can, for example, fly to a given location and using infra-red cameras locate human sized heat signatures for immediate targeting; no sniper will be safe from being blown out of his hiding place. Pucks can communicate with each other and with the host computer using a meshed network where signals are passed down the line. Other pucks can be programmed to cluster into a much larger bomb before simultaneously exploding. Tactical use: The near silent deployment can have a myriad of other uses. Surveillance from on high or with sound and vision lying on the ground, simulated radio transmission sources to attract enemy fire, diversionary attacks from various directions and overhead flares to light up the enemy. They can even provide ‘Shoot me’ targeting information to overhead drones and airborne weaponry. What could be more demoralising to the enemy than intermittent attacks from the air at no significant cost or risk to the other side? The biggest fear will be a ‘Cluster puck’ attack where several successive droves are launched and are resting on the ground nearby in preparation for a massive orchestrated attack. A set of pucks with an affinity for vehicle wheels could be launched and without any difficulty a whole convoy of vehicles could be stopped in its tracks, or what’s left of them! A major comfort to troops in hostile territory will be escorted manoeuvres. Protection from ambush is provided by pucks flying apparently random recce patrols but in fact checking ahead for any heat signatures. Drone warfare will cause a change to military clothing; a wetted and cool outer shell being necessary to avoid being ‘seen’ by a drone’s camera. Even so, once terrain has been optically scanned any changes in position will highlight potential targets. If a drone flies over your hiding place it is likely that you will be attacked by the next one if you move. Computers and drones together make awesome weapons and there is no doubt that ground based warfare is about to enter a new era. Imagine a Landrover carrying a few thousand pucks in racks and on the roof a 6 foot diameter Catherine wheel spinning at 600rpm (car engine tickover) and flicking out up to 5 pucks a second at a launch speed of 120mph. The pucks are introduced into the calm middle of the wheel from an overhead magazine and then nudged sideways into the 3 radial arms where they queue to be released onto the extended launch ramps where they accelerate out to the open edge and away. They gain spin from the friction side of the launch ramps which initially swing out under centrifugal force to make the diameter bigger. The curved channels enable more pucks to be in the queue and also ease the centrifugal force at the end of the curve where the release catch is situated. The loading magazine is itself fed by conveyor that has passed through the arming station. Here a fresh battery, much like a small puck itself, is fitted into the middle of the puck at the top while the mission computer installs targeting instructions via blue tooth. No other system will deploy quadcopters this fast and it may even be necessary to slow it down. Pucks not on suicide missions will return to land on a wide conveyor belt on top of the launch vehicle and from there mechanically re-folded, de-batteried and added to the stack heading for the launcher. In this way it will be possible to have hundreds of drones permanently out on various tasks. Separating the charging function makes long term storage very much easier and every puck receives a freshly charged battery just before taking off. Once deployed returning pucks can be re-batteried and launched back into the fray on a continuous basis. With theoretical launch rates of a mind boggling 600 a minute there would never be time for a person to decide on the mix of missions being fed into the pucks just before they are launched. To do this efficiently the mission computer receives more generalised commands from several operations directors and these are collated and then automatically programmed onto the pucks. Of course the puck concept is perfect for aerial launching too – no need for the launcher, just eject boxes of them to glide under low power for great distances. You would never see or hear the plane that launched a mass of pucks at you and it would be 100 miles away when the pucks arrive. So to anyone who is not smelling the coffee yet here’s the question: Would you commit troops to a ground action where they can’t move, can’t hide, where attacks come relentlessly from every direction, where vehicles aren’t viable and all these things are cheaply applied by an enemy who, barring one launch vehicle, is immune to retaliation?